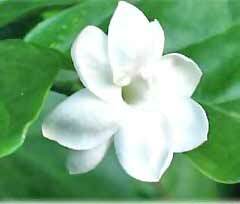 Thank you God for making the Jasmine flower. Yes, I am ever thankful. One may not think much of Jasmine just by looking at it. A native of China and other tropical climates, it’s not extravagant in its beauty but rather simple. Its small, white blossoms form in clusters in large bushes or vines. But it is its fragrance that has captured my heart and has imprinted so many memories of my life into my mind. She is a wonderful surprise that continues to surprise me, every time she shows up. My love for it first started as a child when my mom grew honeysuckle and Jasmine flowers along the back fence of our back yard. On early, sunny mornings in the summer, my mother opened up the sliding glass door to let the light and fresh air in, and the left-over fragrance of Jasmine and Honeysuckle from the night blossoming burst in to the kitchen. I remember the first time I noticed it, I was sitting at the breakfast bar eating my Rice Chex cereal with banana slices and breathed in deeply after her fragrance said hello, a smile blossoming on my face and I looked up at my mom. “What’s that smell?” I asked. And so it began. She surprises me every time, because she doesn’t stand out visually. And her fragrance doesn’t slowly build in its introduction. She may look passive, but she is confident in her fragrant entry. She truly bursts in. One second you don’t smell her. The next second you do. To this day I can be walking along a sidewalk to a friend’s house in their neighborhood or down a pathway on a school campus, thinking of those busy things that occupy so much of our time when we are on our way to wherever it is we are going. Yet the second I get a whiff of that fragrant flower and my mind registers what is happening, I instantly stop and begin sniffing and looking around me for the source. But as soon as I find her, I smile. Thankful and relieved, I pinch off a cluster of the flowers to carry and smell with me as I continue on my way. The first time I bought flowers to fill my own yard as a young adult, I picked Jasmine. It took almost a year before the vines of the bushes grew long enough to cover the side of the fence that framed my driveway. But once it did, and summer nights came near a full moon when the blossoms opened and released their fragrance, I lingered on my way out of my car before I came inside for my night of rest. The stresses of the day would melt away, and I was ready to make dinner and put the day behind me. When I moved into a condo in Carlsbad in my mid twenties, my new roommate Amber introduced me to Jasmine tea. She was sort of a hippy and we bonded over conversations about healthy foods, talks of nature, and finding our life purpose. On one such conversation, she poured me a cup of hot, Jasmine tea and as soon as I raised the cup to my lips to take a sip, the steam from the tea rose up and filled my nostrils. A rush of euphoria filled me and our conversation continued with more smiles and laughter and reminiscent stories of our lives. Years later after that season of my life had long since faded, my good friend Lael got married in the summer at a beautiful country club in San Marcos, CA. We girls were nervously chatting and giddy as we dressed in our bridesmaids dresses, applying makeup, and styling our hair. I left momentarily to find a restroom and take a break from the noise and opened up the back door of the dressing room. Instantly, my eyes were flooded with the mid-morning light and my nostrils with the unexpected and very welcomed scent of Jasmine flowers. There was no need to turn around and sniff out the source. There, five inches from my face flowed a beautiful vine of Jasmine blossoms cascading down a white trellis. I stood there, my nose one-inch deep in the clusters of white, closed my eyes, and just stopped–stopped thinking, stopped looking, stopped moving. I just let the fragrance fill me and let the white light filter through the cracks of the trellis and in between the leaves of Jasmine and through my eyelids. Nothing mattered for the two minutes or so that froze during that time. I just quieted my soul. Then right after I uprooted from that transcendental sliver of time, I prayed—-thank you God for these beautiful flowers you created. How do I explain all the feelings that come over me when I breathe in Jasmine? I did some research and found out that it’s not purely nostalgic for me. Jasmine flowers have been used in aromatherapy for years to rejuvenate the body, raise the moods of those suffering from depression, and relieve stress and anxiety. So much of that makes sense to me. I have had moments in my life when I have been angry or hurt and yet, if I breathe in the scent of Jasmine, whether it be in that hot cup of tea, a bottle of lotion at a Hawaiian-themed surf shop, or in cluster of blossoms I tore from a Jasmine bush on a random sidewalk, I am able to pull out of those emotions, take a break, and move forward, realizing that there is so much more in life that is worthy of being enjoyed. Jasmine has become a self-fulfilling medicine for me. With each pleasing breath I take in of her, she reminds me of every other time she has surprised me in my life and has always brought happiness and peace with each occasion. Some Wonderful Jasmine Products I Just Can’t Live Without! If you like Jasmine–you must try these!